How to make a buttercream flower bouquet. 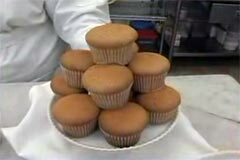 Cupcake decorating in this video tutorial is cake decorating made easy. You will create the perfect yellow Begonia and pink Carnation buttercream flowers. The most important thing to remember; with the right cake decorating tools and cake decorating instructions, any novice can become an expert in decorating wedding cupcakes. You will be shown how to make simple cake decorations with step by step instructions. This cupcake designer makes cupcake decorating easy and fun. 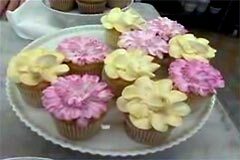 Transforming these simple cakes into wedding cupcakes with cake decorating design ideas using the cake decorating piping bag. Who can resist these gorgeous rich buttercream flower wedding cupcakes. 3. Spatula - this will help pick up the icing, and you'll be able to easily scoop the icing into the piping bag and not make too much of a mess. 1. Make buttercream icing following recipe. 2. White, pastel yellow & pink buttercream. 3. Piping bag and petal wide end narrow tip. These are very simple wedding cake decorating ideas, so try your luck at cupcake decorating. These cake decorating instructions are so easy to follow. The most important thing is to have the right cake decorating tools and the rest is just a little bit of practice and Voila! The perfectly cupcake decorations.